Ocean Optics spectrometers and accessories can be configured into small-footprint systems for measuring the color and absolute or relative irradiance of light sources and displays. Systems are compact, flexible and simple to deploy in various settings. For Photonics West 2017, we’ve designed an experiment demonstrating the effectiveness of our Flame spectrometer to monitor the color and spectral irradiance of digital displays. The experiment illustrates some of the solutions Ocean Optics spectrometers offer for lighting and illumination applications. For the demo, we’ve collected a handful of commercially available digital photo frames, taking care to select a combination of backlit LCD and LED displays, each with different dimensions and screen resolution performance (Figure 1). A radiometrically calibrated spectrometer (Flame-S-RAD) with cosine corrector attached will measure the output of the displays. (STS-RAD is another suitable option for these measurements.) 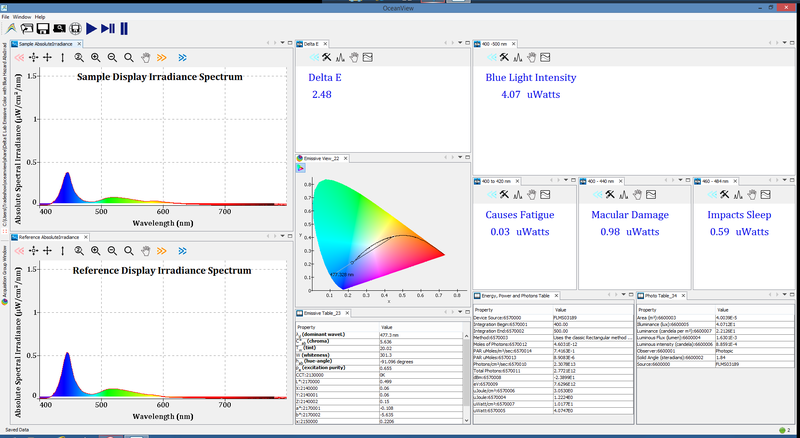 OceanView software calculates color values, color difference and power and photometry values. measures the spectral output and color consistency of emissive displays. As with a relative or absolute irradiance measurement, the spectrometer must be calibrated first. In the demo, our emissive color measurement begins with an absolute irradiance measurement. Establishing an accurate scale for the spectrometer’s response at each wavelength is essential to calculating color and power. Color consistency within samples requires color measurements that are repeatable from one measurement to another. A well-defined method of comparing reflective or emissive color, either within a batch or to an acceptable standard, is also required. Ocean Optics color measurement systems offer both, providing the flexibility to configure the measurement system for various sample types and needs, as well as the software to perform quantifiable color comparisons. Delta E is used to quantify the difference between two colors. A delta E (dE) less than or equal to 1.0 indicates that the human eye will perceive two colors as the same. As the dE increases above 1.0, the perceived difference in color increases. The calculation of delta E takes a subjective comparison of color and provides a quantitative value indicating how different the colors look to the human eye. In some cases, depending on the application, less rigorous dE limits are set where the perception of slight differences in color is acceptable. For this demo, we will calculate the L*a*b* color difference of different locations within an emissive display as compared to a reference location within the same display (Figure 2). Also, that reference display can be compared to the other displays in the demo setup. We can easily update the color reference reflection spectrum at any time during the measurements to calculate dE relative to a different color reference. Irradiance is the amount of energy at each wavelength emitted from a radiant sample. From that data, more specific photopic values can be calculated, including lumens, lux and candela. Measurements in absolute irradiance mode require calibration using a source with known power output. For the demo, we used a spectrometer that was radiometrically calibrated at our calibration lab. The spectrometer came with a calibration file that allowed us to work in absolute irradiance mode. The calibration process generates a file with energy response data for each pixel in the CCD, given in μJ/count. Factoring in the surface area of the sampling optic and the integration time allows irradiance measurements in μW/cm2 to be reported (power=energy/time). Why use a cosine corrector as a sampling optic for a diffuse emissive source like a digital photo frame? The cosine corrector has a 180° field of view and samples any light incident on the diameter of its white diffusing surface, and specifically in that plane. Cosine correctors work well for measuring the power incident on a surface like a screen, in which case it should be placed flush with that surface. For the demo, we’re using the Absolute Irradiance mode in OceanView and running the Photometry, Photons, Power and Energy wizard to get power and a range of other values. For calculating photometry values (lumens, lux, candela), the distance from the display surface must be taken into account. As part of our emissive displays demo, we monitor blue light in the 400-500 nm range. Blue light has the shortest wavelengths and higher energy output than other visible light, so it reaches deeper into the eye. The cumulative effect of this exposure can cause damage to the eyes over time. Blue light exposure has increased with the move from incandescent lighting to compact fluorescent and LED lighting and with our constant exposure to digital screens. In our display monitoring demo, calculation of color parameters and blue light intensity is possible using OceanView software.